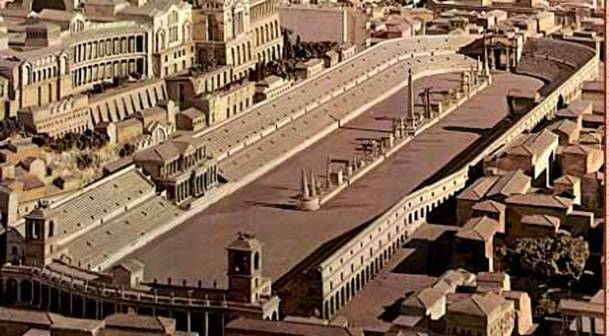 The famous Circus Maximus in Rome was an entertainment stadium used for chariot racing and other sports during the historic days. This famous race track had an underground Mithraic Temple which is mysteriously obscured 45 feet below ground. The Mithraeum discovered in 1931, is in fact a temple devoted to the Pagan God ‘Mithras’. Mithraism has its roots somewhere between Persian and Greek mythologies, but in Italy it was predominantly practiced by Roman soldiers. It has been revealed by archeologists that Mithraism had been the unofficial religion of the Roman army as it gave importance to the idea of fighting for the cause of good. Mithras is generally portrayed as the guardian of truth and light in Zoroastrianism. The extraordinary fresco of Mithras slaying a bull, found in the Mithraeum of Circus Maximus tells an interesting story of pagan cult where the pagan God Mithras and the bull existed on a desolate land before the subsistence of other creatures. It is said that Mithras killed the bull and from the spilled blood of the bull all other life forms came into existence. The original fresco of Mithra is maintained for preservation, but you can see the replica of it in the Mithraeum. Unlike other historical places in Italy which were buried under the ground by the course of nature, the Mithraeum of Circus Maximus is a secret chamber deliberately positioned underground during the ancient days. Brick walls with arches and marble floors of the Mithraeum are preserved perfectly even today to maintain its originality. The central sanctuary has been tiled with white marbles and has two slots for the statues of Caute & Cautopates and a place of honor, probably for Mithras. The five secret chambers were designed to be dark and small, ideal for performing various rituals and sacrifices slyly. You can feel the mysterious primeval touch in every brick of this Mithraeum. At present this Italian architecture lies below the Foundation of Rome’s Teatro dell’Opera which is one of Italy’s main tourist attractions. You can visit this Mithraeum only with prior appointment. To know more about the Mithraeum of Circus Maximus, visit PerilloTours.com. This site also gives authentic information on other Italy travel destinations. Very helpful for my GCSE knowledge of Mithras, thanks!